Spring is here and it’s time to clear away the effects of winter on your parking lot. We can help. Now that spring is officially here, it’s time to breathe some fresh life into your parking area, and clean up all the leaves and debris that have accumulated over the winter. You want to give your customers a great first impression, and you know that a spotlessly clean parking lot is an easy way to project the image of success. Quality equipment operated by quality people – Our fleet of sweeper trucks feature onboard GPS guidance, which enables our operators to work more quickly, and you’ll never have to worry about them “missing a spot.” But a great truck is only as good as its driver, which is why we insist on hiring great people, and making sure that they’re all properly trained. Service on your schedule – Most of our clients prefer to set a scheduled pavement maintenance plan during off-peak hours, and we offer plans to fit any budget. If your lot needs sweeping between regularly scheduled service calls, give us a call, and we’ll be there. And if you ever have an emergency, we also offer 24 hour on call service. Unrivaled customer service – We built our reputation on quality, dependable, customer-oriented service. Reputations that take a lifetime to earn can be undone in the blink of an eye, which is why every member of our team is committed to do whatever it takes to make sure our customers are happy. To schedule a no-cost, no-obligation assessment and estimate, you may give us a call at (501) 945-3219 or contact our office online at this link. 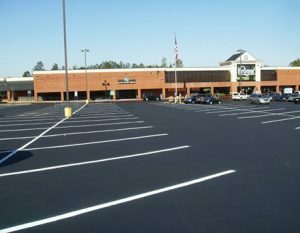 In no time, you’ll discover what our clients know; the cleanest parking lots are serviced by C&C Commercial Cleaner, Inc.